The ZWK10 multi-channel keyboard allows remote control of electrical devices compatible with the Z-Wave system, e.g. Z-Wave roof window, ZWS230 or ZWS12 motors, ARZ Z-Wave or AMZ Z-Wave awning blind, ARF Z-Wave, ARP Z-Wave blinds or AJP Z-Wave Venetian blind. The keyboard can operate up to 10 receivers separately or 231 accessories in groups. 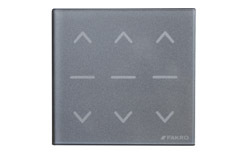 Made of toughened glass this modern-looking, multi-channel touch keyboard enables control of electrical devices compatible with the Z-Wave system, e.g. Z-Wave roof window, ZWS230 or ZWS12 motors, ARZ Z-Wave or AMZ Z-Wave awning blind, ARF Z-Wave, ARP Z-Wave internal blinds or AJP Z-Wave Venetian blind. The SWG3 keyboard can operate up to three accessories separately or up to 231 accessories in groups. 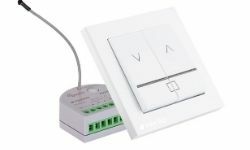 ZWL1 Single Radio Controller Z-wave "New"
It consists of a wall switch and radio module fitted in flush mounted junction box. 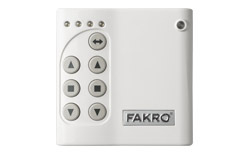 It allows remote control of a single device or a group of Z-Wave devices (up to 231 devices). It operates e.g. actuator ZWS230, ZWS12, external roller shutter ARZ Z-Wave, awning blind AMZ Z-Wave, blackout blind ARF Z-Wave, roller blind ARP Z-Wave and Venetian Blind AJP Z-Wave. ZWL2 Double radio controller Z-wave "New"
It consists of a double wall switch and radio module fitted in flush mounted junction box. It allows remote control of two Z-Wave devices independently or a group of Z-Wave devices (up to 231 devices). It operates e.g. actuator ZWS230, ZWS12, external roller shutter ARZ Z-Wave, awning blind AMZ Z-Wave, vertical awning blind VMZ Z-Wave, VMB Z-Wave, blackout blind ARF Z-Wave, roller blind ARP Z-Wave and Venetian blind AJP Z-Wave. 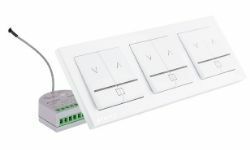 ZWL3 Triple radio controller Z-wave "New"
It consists of a triple wall switch and radio module fitted in flush mounted junction box. 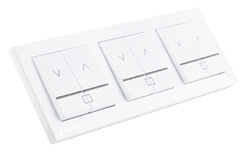 It allows remote control of three Z-Wave devices independently or a group of Z-Wave devices (up to 231 devices). It operates e.g. actuator ZWS230, ZWS12, external roller shutter ARZ Z-Wave, awning blind AMZ Z-Wave, vertical awning blind VMZ Z-Wave, VMB Z-Wave, blackout blind ARF Z-Wave, roller blind ARP Z-Wave and Venetian blind AJP Z-Wave. 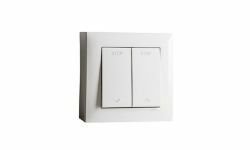 LP1 Single wall switch "New"
Single wall switch with momentary contact allows potential-free control of a single device such as AMZ Electro 12, AMZ Electro Solar, VMZ Electro 12, AMZ Electro Solar or inputs of ZWMA or ZWMA1 conversion modules. 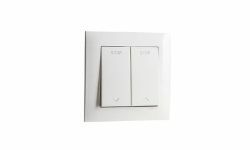 LP2 Double wall switch "New"
Double wall switch with momentary contact allows potential-free control of two devices independently such as AMZ Electro 12, AMZ Electro Solar, VMZ Electro 12, AMZ Electro Solar or inputs of ZWMA or ZWMA1 conversion modules. 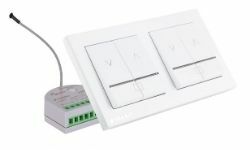 LP3 Triple wall switch "New"
Triple wall switch with momentary contact allows potential-free control of three devices independently such as AMZ Electro 12, AMZ Electro Solar, VMZ Electro 12, AMZ Electro Solar or inputs of ZWMA or ZWMA1 conversion modules.. 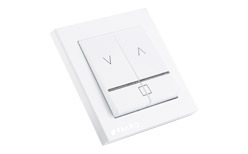 Flush mounted single wall switch with hold option to operate a single device such as the AMZ Electro 230. 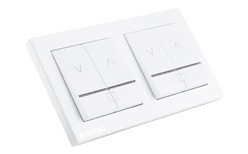 Surface mounted single wall switch with hold option to operate a single device such as the AMZ Electro 230.